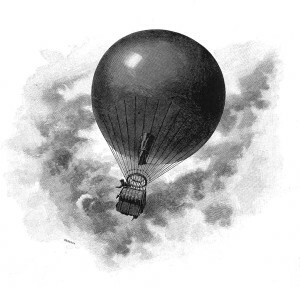 On the afternoon of September 15, 1893, aeronaut “Prince Leo”, age 16, was scheduled to perform a balloon ascension and parachute drop at Savin Rock in New Haven. An estimated crowd of 1,000 people had gathered to watch the event. After the balloon had risen about 300 feet it suddenly developed a tear allowing the gas to escape. The balloon, with Prince Leo still aboard, rapidly fell and crashed into the top of a tree. The impact tossed Leo from the car and he hit a live electrical wire used by trolleys. When help arrived he was badly cut and in shock from the jolt, but he later recovered. “Prince Leos” real name was Albert Leo Stevens, (1877 – 1944) who went on to become a world famous aeronaut. Stevens began performing under the stage name, “Prince Leo, the boy aeronaut”, when he was just 13.